PETALING JAYA: Sept 22 proved to be an “auspicious date” for Eco World Development Sdn Bhd, as its maiden project EcoBotanic in Iskandar Malaysia received overwhelming response from home buyers. It carried out a balloting for its EcoBotanic houses in Nusajaya, Johor. At the same time, more than 10,000 people registered interest in its mixed integrated development EcoSky in Taman Wahyu in Kuala Lumpur, at its new sales gallery there. Out of the 624 cluster homes and semi-detached houses on sale at EcoBotanic on Sunday, the 500 units allocated for the non-bumiputra segment were snapped up by buyers within six hours. Many were attracted to the project due to its strategic core location in Nusajaya, which is the “Gem of Iskandar Malaysia”. The project is located just next to EduCity, the region’s upcoming premier education hub and a destination for quality, world-class education. Other amenities in place within a few minutes’ drive from the project include the Puteri Harbour Waterfront Development, Medini and Legoland Theme Park. “We are happy to note that our buyers have given their thumbs up to our maiden project despite our new presence in Iskandar,” chief executive officer Datuk Chang Khim Wah told StarBiz. The cluster homes, with a floor area of between 2,400 sq ft and 3,100 sq ft, are priced between RM900,000 and RM1.3mil, while the semi-detached houses with a 3,400-sq-ft built-up area are priced between RM1.8mil and RM2mil each. 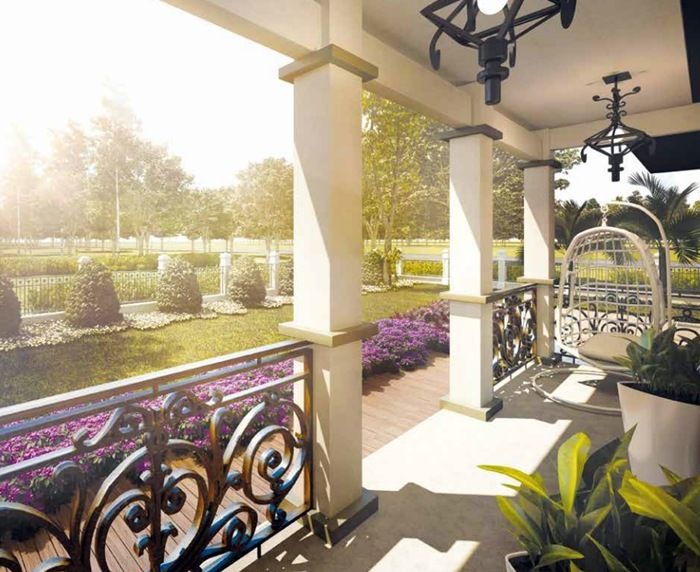 Artist’s impression of a Davenham 32′x70′ verandah home within the EcoBotanic project in Johor. The launch of the project was also held concurrently with the opening of the company’s sales gallery located along the same row as S P Setia Bhd’s Bukit Indah sales gallery. He said that based on the response received from buyers, the company is confident that it would emerge as one of the leading players in the property sector in Iskandar in years to come. “As most of us are formerly from S P Setia, it helps to sell our products, as our buyers believe that the company has S P Setia’s DNA in it,” he said.However, Chang said Eco World is not SP Setia, adding that the company would strive on its own capacity and capability. He said EcoBotanic, situated on a 118.80ha site, would have 1,200 units of landed property and 1,500 high-rise residential units, which would be developed over eight years with a gross development value (GDV) of RM3bil. Chang said in the pipeline was the company’s new township in the Tebrau area spanning 246ha, which is expected to be launched in the second quarter of 2014. Pic courtesy of Propertywtf forum. 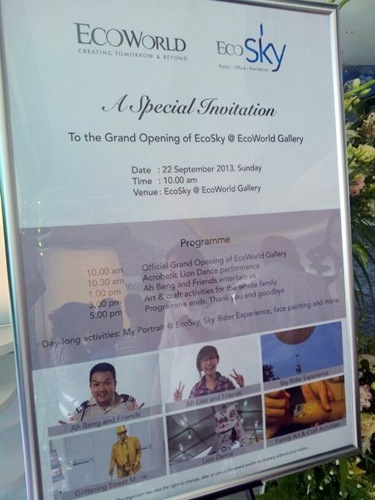 Meanwhile, more than 5,000 people attended the official launch of its sales gallery, which is located at the project site of EcoSky in Taman Wahyu in Kuala Lumpur. The visitors had the chance to preview the project, which sits on a 4.05ha freehold tract. Company officials said more than 10,000 people had registered interest in the mixed integrated development to-date. “We received very strong interest from potential home buyers for EcoSky, although we have not officially launched the project,” Chang said. The official launch for EcoSky is expected to be at the end of next month or in early November. Analysts told StarBiz that people were showing confidence in Eco World’s projects due to the management team’s vast experience. With a GDV of RM1.2bil, the project will consist of 36 retail units and 940 serviced apartments. Sales and marketing, credit control and customer care head Evon Yap estimated the selling price for the residential units to range from RM600,000 to RM860,000.